Our Assortment of Teas - China Restaurant ZEN in Adliswil, near Zurich. Famous for Peking duck and authentic Hong Kong style dim sum with organic ingredient and vegetarian menus. In the case of black tea, we are talking about the dried leaves of the tea shrub “Camelia sinensis”, which may grow up to a height of 15m. The processing of the harvested leaves takes place in five steps: withering, rolling, fermenting, drying, and packaging. During the slow drying (fermenting), the cell sap of the leaves oxidises and the leaves slowly change colour from dark green to copper red. During this critical stage, all active components are set in motion, and the process must be interrupted at this exact point for the tea to “succeed”. Oolong comes from the Chinese term Wu-Lung. It means “black dragon” and is a semi-fermented tea. It is only fermented for a short time and its flavour lies between black and green tea. Green tea originates from the same plant as black tea and differs from it only insofar as it is not fermented. It contains a bit less caffeine and a bit more tanning agent than black tea. It is either not left to wilt at all, or only for a short time. 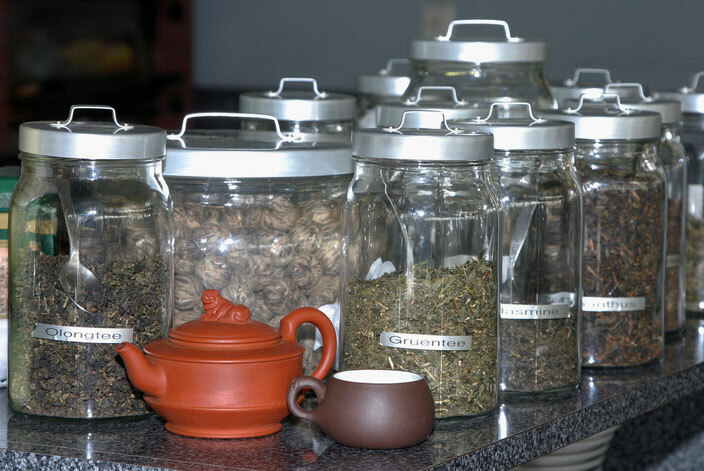 Due to the lack of fermentation, more enzymes and vitamin C remain in the green tea. The addition of fragrant petals during the production of black or green tea produces flavoured tea. It is named after the respective petals. A rare, un-fermented Chinese tea from Kwangsi. The leaves are covered with down and after the harvest are individually air-dried. The fusion is full of character, mellow in flavour, but nonetheless aromatic.